I found the Stanley steam car engine when I went to visit a friend in Scunthorpe, he is a member of the local Model Club and used it to drive a large model with steam generated from a stationery boiler. I had met Reg Parsons at Bob Dales open day and that gave me the idea of making a Steam Car. Reg very kindly said he would make me a boiler. At the same time while on holiday, I paid a visit to Buliegh Museum, here I managed to get a small line drawing of a Locomobile from a book they had. With a lot of help from Reg, I got started and slowly it began to look like a Locomobile steam car. I was unfortunate to be struck down with Polio when I was 20 years old, so I have to walk with two sticks and can only manage a few yards. The machining was mostly done sitting down, with help from friends overcoming some of the more difficult tasks. When the car was finished, the next problem was how was I going to get on it and have a drive. An old bath lift was put to use, lifting me up to where you usually put your feet, and with a lot of "Pushing and Shuving" I managed to get on the seat. Getting off was something like!!! well you would laugh Ha! Ha! 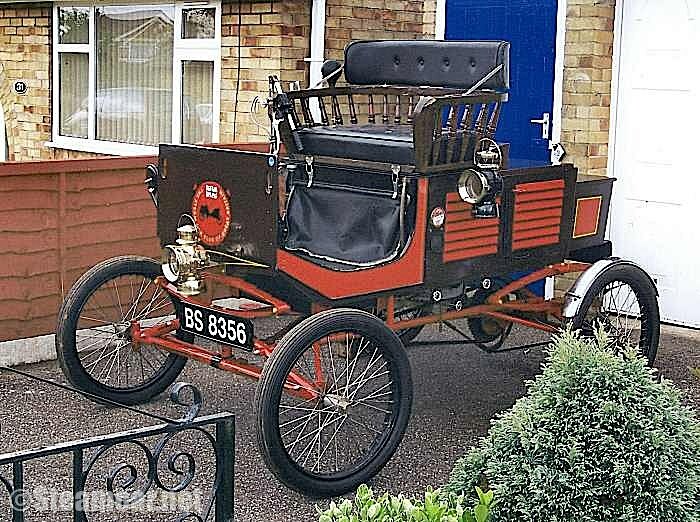 Perhaps its not the best looking Steam Car but it has given me a lot of pleasure.